Have been very busy with life and other stuff. Is the interest still here for fancy layouts? Should I keep making 'em? i gotta say these are indeed very nice. some is even designer potential (ish). lol i was thinking that in was it the second lyt u made i think with the city buildings. Scenery such as cranes and buildings will be at later date! Just realised Turn 7 and 8 are slightly misscaled. Will adjust and put the scenery in! This will be nice! Absence is key... haha. Sorry for the lack of posts! Who's pumped for this track? Last edited by MicroSpecV, Sat, 14 Jul 2018 14:34 . Quote from MicroSpecV : Who's pumped for this track? I've returned for a brief respite in Layoutting this year. This might be my one and only layout this time; I am indeed busy with other projects around Adobe, Sketchup, 3Ds, aaand you get the point! Thank you everyone for your support for this series! This is a track I've always wanted to redo, having done a smaller version on Autocross. Chosen location is Aston - the backdrop and scenery very much suits the environment of the actual track! DTM does some crazy races here, and Norisring is steeped in history as one heck of a small rocket circuit. Blitz around the track in the GTRs for that authentic DTM feeling, or take something like the FBM and relive the European FBM Series. The track is accurately scanned and outlined before put up in LFS. It is correctly scaled, and all environment objects like buildings, grandstands and cranes are exact to real life, giving a great visual display as well as depth, which most object-type layouts lack! Heck, have fun burning some tires! Below you can find the file for original Norisring layout along with Updated v1 version with "gravel trap" (as seen in bottom post). 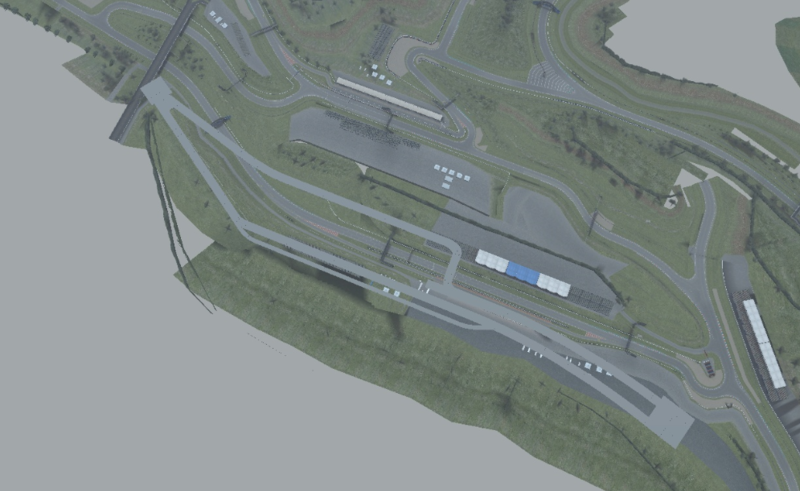 Small update to Norisring layout, with full pit lane with pit boxes, along with a podium. Also added is a first - prototype "gravel" trap in Turn 1 run-off zone. This is to discourage use of run off, as well as to produce more spectacular off's! Acts like a old-style sand trap by slowing cars faster than just the slippery concrete. Also beaches cars like the Formulas or GTR. I hope it simulates well! (edit) no you can't fly off the wall. Sadly. See you all in the next edition of Layouts! Check out my TC Layoutting series! Join Apex Online Racing today! Last edited by MicroSpecV, Wed, 5 Sep 2018 14:29 . Last edited by MicroSpecV, Fri, 31 Aug 2018 07:51 . As the description may hint, this is a rather fun and stressful challenge. Viral it could be; but definitely one to try out on a boring Sunday. If you are a Pikes Peak or Goodwood fan, this is a must try! Simple idea - run a fast car along the sidewalk of Blackwood yard with next to no run off. Challenge your friends to the fastest time possible! No preview this time - try it out to find out! Here is a mini-version of one of Indonesia's discreet race tracks. Located just off capital Jarkata, this track provides close racing in lesser powered cars, and can also be a decent drifting circuit! Less popular to us, it may prove an interesting challenge with the twisty middle sector. Have fun! Credits to ltras for suggesting this! Last edited by MicroSpecV, Wed, 5 Sep 2018 14:26 . Impressive Niko. Might have to try this. 0:49.86 clean, 0:49.42 with a small wall-ride. Used traction control off the line, then turned it off down the first straight before the first bin. You need it off after that or you lose too much time. Amazing runs Niko, Pete. Didn't know what to expect running the BF1 around a banter course, but now I know. I won't be accountable for any broken wrists! Quote from mbutcher : 0:49.86 clean, 0:49.42 with a small wall-ride. I used a modified AS1 set too. Quote from mbutcher : I used a modified AS1 set too. Seems the fastest, Pete! Maybe after hours of tweaking you can go faster. Thank you for your continuous support. It really honestly means a lot to see people enjoying my work and it's rewarding even though there isn't much league usage (yet). Gives me the drive to continue thinking and crafting each track with joy and I hope I can continue to do so! Every track from start to current has had a facelift and/or grid expansion. 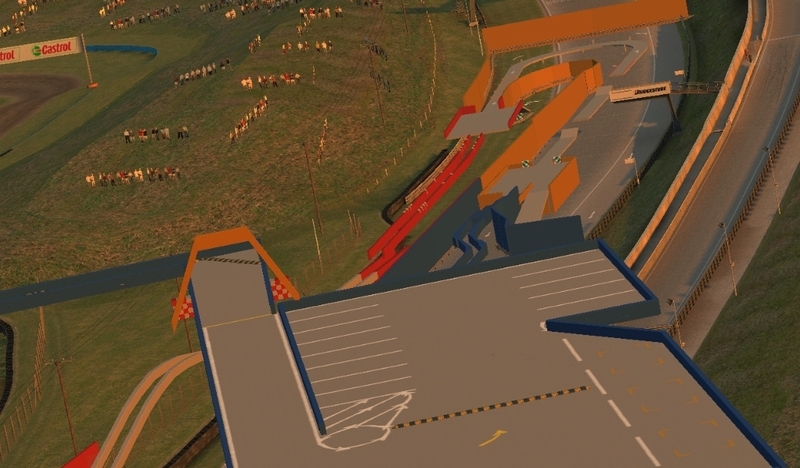 All of these updated race-spec courses have been uploaded with "V3" in the name. Do have a look! Personal Favourites? I'll have to say Monaco, Norisring, Mid-Town Ring. And of course, the Lmaoring - named for the fun we had with our late racer in LCS-R, Marcus, who sadly passed on last year. In his honor, the updated inner stadium section now features the finalised Marcus Arena structure. Last edited by MicroSpecV, Sat, 20 Oct 2018 08:08 . NOTE : Course aesthetics have improved since above video. Return stage routes have been widened, and stages color coded.. Ever wanted to test your precision driving and patience? Wait no further! I bring to you a two-part Ninja Warrior/banzuke influenced obstacle course, dug up from the archives of 2016! Few have conquered this course and fewer have done it in a fast time. Will you be the king of the course? First ever competitive small-scale obstacle course I've made that will take more patience than most others! Carefully constructed to be neat, whilst being fully doable and isn't made of all-armco that will wreck your FFB wheel. Put your slow precision driving skill to the test in this 4 stage course with your friends or simply take a spin and attempt to finish the run in quickest time possible. Upload your attempts if you wish! Recommended vehicle is XRG. Each stage has a "return-to-stage route" to the stage start just like the real Ninja stages. You do not have to restart the entire course if you fall off once. Have fun, and be sure to stay... calm! Last edited by MicroSpecV, Sat, 15 Sep 2018 09:38 .
is 1st person view viable for this course? Quote from Aw3som3G4m3rzYT : is 1st person view viable for this course? Nice track attempt! But I'd like if you don't advertise on other people's work thread, thanks!